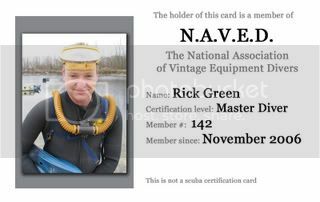 Please, please, please send photographs of decent quality, no underwater. Recognizable photos of yourself in vintage gear are what we want. Geeez, get your wife, brother, dog, mother, to take a photo of you. Make the effort, afterall, we are making the effort to make you the card. We want them to look nice. That means a surface photo, torso up or shoulder up so we can make YOU a nice card you will be proud of. Let me be clear--we will not accept unrecognizable or unrecognizable UW photos for your card. We would sincerely appreciate NO UW photos please. Terry, if you send a photo with a Spare Air you will join infamy as the second person to be black balled from NAVED. VINTAGE equipment as much as possible please. Sorry if I sound grouchy but this is for you guys, let's keep them nice and pro looking. 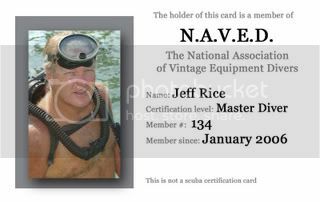 Photo credit goes to my divebabe wife, Susan. All I did was stand where she told me . . .
That's a very nice dress you're wearing, Mrs. Cleaver . . .
Now, that is what we are talking about, good photo and the ones above as well. I realize the photo standards were not clear and a few have slipped through but this is the kinda of photos we want. It does not have to a great photo, just recognizeable. Afterall, if babies cry at your sight, your mother refuses to acknowlege you in public, dogs bite you and lenses crack, well , just do your best. I wish I'd thought to do mine in B&W. 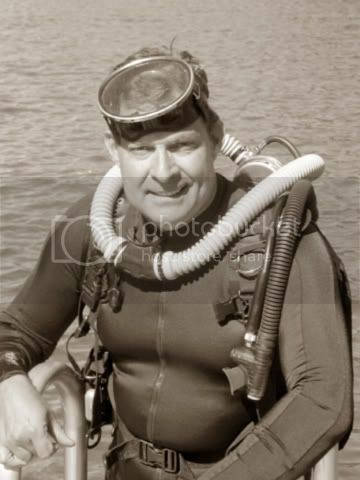 Gives it that real "Sea Hunt" look. What you do is shoot it with digital camera. Import into Photoshop. Convert from color to grayscale. Play with contrast, brightness and levels. Then convert back to RGB color. Adjust color balance to add some yellow, as B&W pics yellow as they age, and maybe a touch of red to soften, and BINGO! You have a pic that looks like it was shot the year you were born! 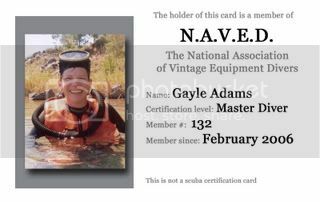 But again, credit must go to my wife/dive bud Susan. The pic appears EXACTLY as composed, no cropping.